Cheesecake. Oreo. Cookie dough. Can of cherry stuff. Melt butter and in a medium bowl, combine with Oreo crumbs. Press into a well prepared 7-inch springform pan and create a bottom crust. Press Oreos into crust, vanilla side down. Scoop out mini balls of cookie dough and press onto each individual cookie. Place cream cheese in stand mixer and mix for 30 seconds to a minute on medium-high speed. You want to cream cheese to be creamy in texture. Add in sugar and then eggs, one at a time. Scrape bowl with spatula and mix for about 30 more seconds on medium, until all ingredients are fully incorporated. 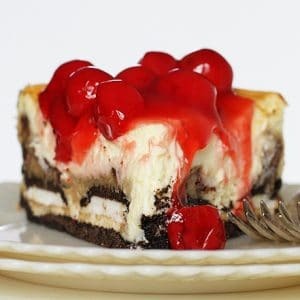 When ready to serve, pour cherries over cheesecake.